Although smartphone screens are getting bigger and bigger, some consumers still choose to watch their favorite movies or TV series on tablets. If you want to buy a more cost-effective tablet, Amazon Fire HD 10 is is the best choice. A great value for a 10-inch tablet with a high-res screen and solid performance. Starts with 32GB of storage, the same as an iPad. Hands-free Alexa works as well as it does on an Echo. Starting at $150, It’s less than half the price of the current basic 9.7-inch Apple iPad, which is $329. Both devices start with 32GB of storage and HD screen resolutions — 1,920*1,200 for the Fire HD, 2,048*1,536 for the iPad. If you plan to transfer and play Blu-ray movies on Fire HD 10 on the go and offline, you have to rip, convert and compress Blu-ray movies to Fire HD 10 supported formats on your PC. Before the movies conversion and play Blu-ray movies on Android tablet, we need to know of what formats can play on this Android tablet. Fron Amazon site, we can confirm Fire HD 10 supported AZW, KF8, TXT, PDF, unprotected MOBI, PRC natively, AAX, DOC, DOCX, JPEG, GIF, PNG, BMP, non-DRM AAC, MP3, MIDI, PCM/WAVE, OGG, WAV, M4V, MP4, Dolby Digital (AC-3), Dolby Digital Plus (E-AC-3), AAC LC/LTP, HE-AACv1, HE-AACv2, MKV, AMR-NB, AMR-WB, HTML5, CSS3, 3GP, VP8 (WEBM) files playback. So for playing Blu-ray movies on Fire HD 10, wen can convert Blu-ray to MP4 or other videos format supported by Fire HD 10. Acrok Video Converter Ultimate targets at Amazon tablet users which can professionally convert Blu-ray to Fire HD 10, Fire HD 8, Fire 7, Fire 8, Fire 7 Kids Edition, Fire HD 8 Kids Edition, Fire HD 10 Kids Edition supported video and audio formats including MP4, H.264, M4V, AAC, etc. 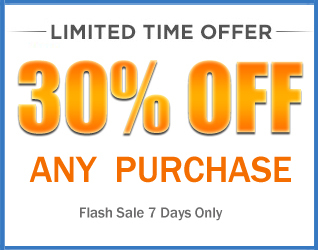 with particularly fast conversion and excellent quality. This Blu-ray to Fire HD 10 Converter has the ability to remove almost all Blu-ray copy protections to rip any Blu-ray. In addition, the intuitive UI is extremely easy to operate. With this Best Blu-ray Ripper, you could make your Amazon Fire HD 10 and more Android tablets more wonderful. 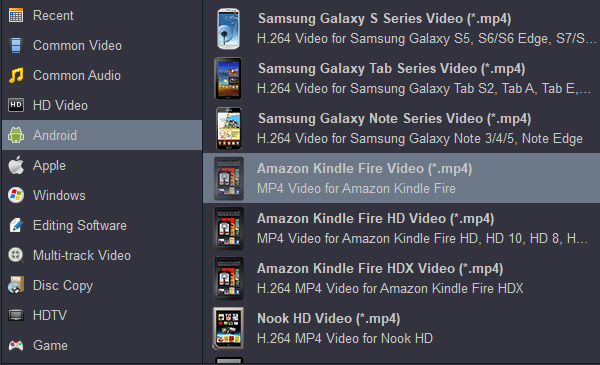 How to rip Blu-ray to H.264 MP4 for playing on Fire HD 10? This tutorial tells you how to rip Blu-ray for Fire HD 10 in Windows (Windows 10 included). First, you need to download and install the top Blu-ray Ripper, which can help you backup Blu-ray to computer easily and quickly with excellent quality. Insert the Blu-ray disc into your PC’s Blu-ray drive and click Load Disc to add the Blu-ray movies you’d like to convert. 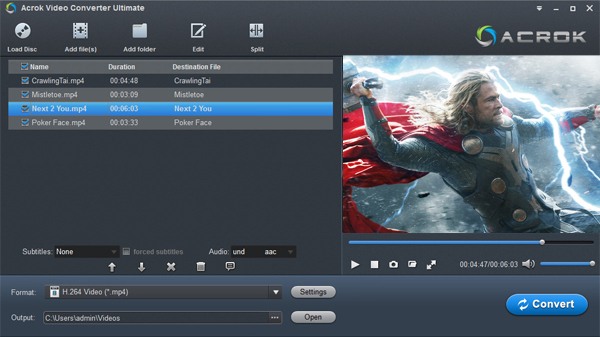 Note that Blu-ray ISO and Blu-ray folder files are also supported by this software. Here comes to choosing the output video format by clicking the “Format” column. In the pop-up list, you need to choose one of the video formats as the output format. I recommend you H.264 Video MP4, because it is the most widely used video format, and also a nice format helping to copy a Blu-ray to computer. You can play Blu-ray on Fire HD 10 with full screen. When the settings are OK, you can go back to the main interface and tap the “Convert” button to start the Blu-ray to H.264 MP4 conversion. The software will do the rest automatically. When the conversion finishes, you can click “Open” to access to the converted MP4 videos. Connect your Fire HD 10 to you PC then transfer the movies to yout device via USB cable. You can enjoy Blu-ray movies on Fire HD 10 for free now. Have fun. The Huawei P30 Pro is not a complicated phone: it’s got a familiar and fast Kirin 980 processor, the same dimensions and all-glass design as every other flagship handset, and the same bonus features like wireless charging and waterproofing. Rocking the largest screen in this series, it’s a 6.47in OLED FHD+ display with a 2340×1080 resolution. If you want a mobile phone with powerful camera function, Huawei P30 Pro is your best choice. Here, we will discuss how to watch Blu-ray movies on Huawei P30 Pro. How to watch Blu-ray on Google Pixel 3a/3a XL? Canon XA45 and XA40 camcorders are popular since they are released, have you got canon XA45 or XA40 to record 4K UHD videos? You will get top quality videos if you choose to capture footages in 4K resolution. To edit Canon XA45/XA40 recorded 4K UHD videos in Final Cut Pro X smoothly, you may want to learn the best workflow to handle the Canon 4K videos, just follow the content below, we will share the best Canon XA45/XA40 to FCP X workflow. Canon XA55 and XA50 are new 4K UHD camcorders released at the spring of this year, many studios, professional users and amateur users have selected the XA50 and XA55 camcorders to capture high quality 4K UHD videos as well as full HD 1080p videos, in this article we will share the best workflow to edit Canon XA55 and XA50 recorded MXF and MP4 files in FCP X via Apple ProRes codec. How to play Blu-ray on iPad mini 5 tablet with supported format? At the spring of this year Apple released its new iPad mini 5 tablet, more and more users choose to purchase this new Apple tablet to use on the go. You may like watching movies with tablet, just follow this article we will share the best tool to rip and convert Blu-ray to iPad mini 5 supported video format, and then you can play Blu-ray on iPad mini 5 smoothly. At the spring of this year Apple released its new tablet iPad Air (2019), which equipped with A12 Bionic chip and 10.5‑inch Retina display, Apple Pencil and the Smart Keyboard is also supported, so it is a wonderful tablet for you when you want to replace your old tablets. Maybe you have got the iPad Air (2019) tablet, and you may want to play Blu-ray and DVD movies on iPad Air (2019). How can we watch Blu-ray and DVD movies on iPad Air (2019) smoothly? After you read this article, you won’t need to worry about iPad Air Blu-ray and DVD video playback problems, and you will be able to watch Blu-ray and DVD movies on iPad Air (2019) easily. How to play Blu-ray movies on Windows 10 Home/Pro? How to watch Blu-ray on Smart TV via HDMI from iPad Mini 5? iPad Mini 5 is the new touchscreen tablet created and developed by Apple. The iPad Mini 5 has a dimension of 6.1 mm and sports a 7.9-inch (diagonal) LED-backlit Multi-Touch display. This tablet is powered by an A12 Bionic chip with 64-bit architecture. Plus, the iPad Mini 5 includes 8-megapixel camera, 64GB/256GB internal storage, a powerful battery that provides up to 10 hours of surfing the web on Wi-Fi, watching video, or listening to music. Ever thought of watch Blu-ray movies on Smart TV via HDMI from iPad Mini? You will certainly have a wonderful experience.